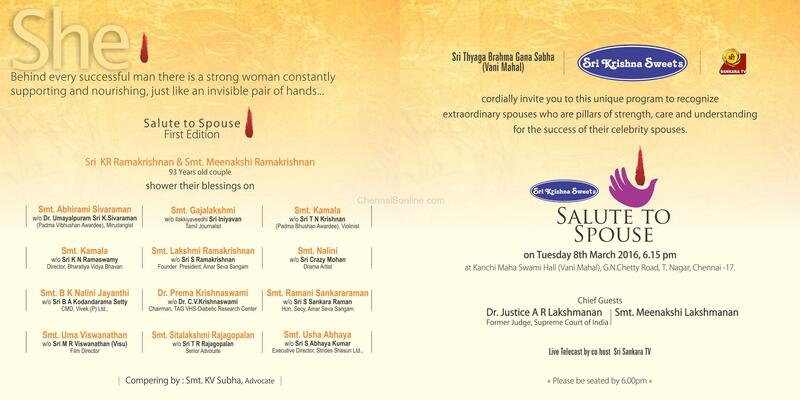 Sri Krishna Sweets is proud to conduct ‘Salute to Spouse’ a unique program to felicitate spouses of celebrities, who had been their pillar of strength standing by them at all times, supporting them in all their attempts and make it a successful venture. This is the first of its kind organised by Sri Krishna Sweets as a fitting tribute to Women community to commemorate with Women’s Day that falls on 8th March 2016. The program presided over by Dr Justice A R Lakshmanan, Former Judge, Supreme Court of India and Smt. A R Lakshmanan will be held at 6. 15 pm in Sri Thyaga Brahma Gana Sabha (Vani Mahal), T Nagar. The first edition will feature Smt.Abhirami w/o Padma Vibushan Umayalpuram Sri K Sivaraman, Mirudangist, Smt. Gajalakshmi w/o Ilakiyaveethi Sri Iniyavan, Tamil Scholar, Smt. Kamala w/o Padma Vibushan Sri T N Krishnan, Violinist, Smt. Kamala w/o Sri K N Ramasamy, Director, Bharatiya Vidya Bhavan, Smt. Lakshmi Ramakrishnan w/o S Ramakrishnan, Founder President, Amar Seva Sangam, Smt Nalini w/o Sri Crazy Mohan, Drama Artist, Smt. Nalini Jayanthi w/o B A Kothandaraman, CMD, Viveks Ltd, Smt Prema Krishnaswamy w/o Dr C V Krishnaswamy, Smt Ramani Sankara Raman w/o Sri Sankara Raman, Honourary Secretary, Amar Seva Sangam, Smt Uma w/o Sri M R Viswanathan (Visu) Film Director, Smt Sitalakshmi Rajagopalan w/o Sri T R Rajagopalan, Senior Advocate and Smt. Usha w/o Sri Abhay Kumar, CMD, Shasun Chemicals. Advocate Smt KV Subha will compere the program. 93 year old couple Sri KR Ramakrishnan and Smt Meenakshi Ramakrishnan will shower their blessing on the couples to be felicitated which will be the highlight of the function.